"it was so entertaining and I learnt a lot.. I learnt too much you must read it." 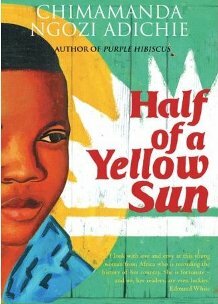 Chimamanda did a great job I must say, she was awarded the Orange Prize for Fiction for this book. Excellently written, very understandable and an easy read. It narrates on a personal story that took place during the Biafran War, story of love, betrayal, desperation and human relationship. It gave me better understanding of what the war was like and how the Nigerian family of different classes had to deal with it. This is a book I highly recommend to everybody. This novel has been reviewed in Spanish in Literafrica by Sonia Fernandez, please click here to read. Hi Lonnie, the story you read in Gods and Soldiers of which I also have read is an independent short story from the novel. All the same you would love the novel. Sorry not from the novel, same title but different story!